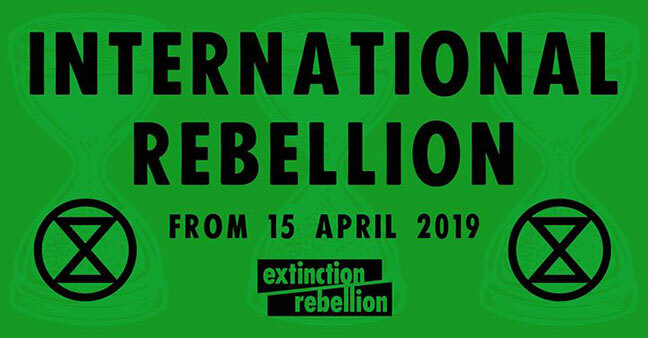 As we head into what Christians call Holy Week – the week when we remember Jesus’ Palm Sunday arrival in Jerusalem, his teaching in and around the city, his arrest, crucifixion and resurrection – Extinction Rebellion are embarked on their international rebellion. Christians sometimes also call this week The Passion. And there is little doubt that passion is what is being stirred on the streets and in the schools of this country and beyond. Indeed, perhaps the sort of righteous anger and urgency that takes communal and peaceful form in protest is the most holy thing we will see this Easter time. At the festival this summer, Amnesty International CEO Kumi Naidoo will speak about civil disobedience as being a key tool in changing the world. And the chair of our partner Christian Aid, Rowan Williams, has spoken here about why he sees these acts of rebellion as necessary, because “the future of the human race is now at stake”. The story of that first Easter week speaks of Jesus entering into Jerusalem on Palm Sunday from the east, down the Mount of Olives, riding on a donkey, his followers and the people of the city lining the streets and laying Palm branches before him. At the same time, a Roman Garrison would have been marching into the same city from the west, mounted on their war horses, and laden with their weaponry, ready to ‘keep the peace’ in Passover Week. There is a deliberate choreography in this. Jesus was leading his own act of rebellion, his own non-violent act of peaceful resistance in the face of Empire. So, as pupils continue their Friday strikes and as Extinction Rebellion begin their international rebellion, we are challenged this Easter to this to think again about what is holy. Extinction Rebellion will, of course, be with us at Greenbelt this summer and they – alongside our partner Christian Aid, whose theme for Greenbelt is ‘The Almighty Power of People’ – will be provoking and inspiring us to join them in rising up to challenge the status quo. This Easter, perhaps it’s time for us to find the rebel inside. Our future and our faith might just depend on it.